MUSTANG, Jan 10: Continuous snowfall since the last few days in Mustang has hard-hit people’s life. Even cattle have been bearing the brunt. However, farmers say that they are happy as snowfall is expected to bring back the moisture of the soil triggering better yield for their crops. 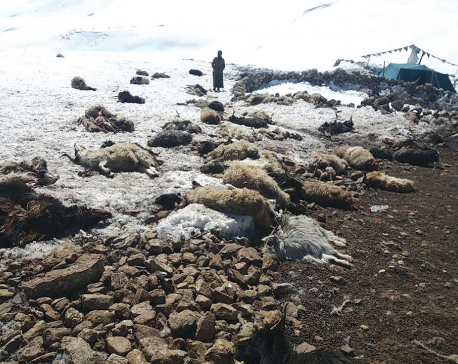 Farmers remarked that because of the inadequate rainfall and snowfall in Mustang for the last five years, the yield of their winter crops was badly affected. 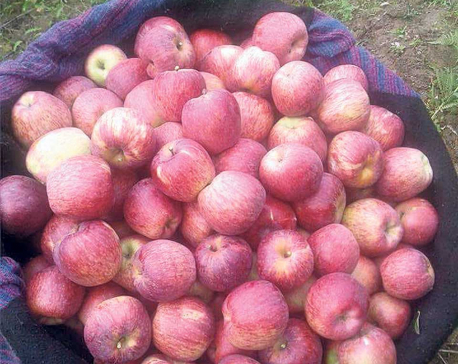 A huge number of farmers including Thakali in Mustang are involved in apple farming. Though other crops and fruits can survive or even thrive in warm weather, this does not apply to apple. “If you are an apple farmer, you turn very anxious about having sparse rain and snowfall during winter. There are other crops too, which need cold weather. But some farmers who are, for instance, doing seasonal or off-season vegetable farming, are not that bothered as us apple farmers, if there is low rain and snowfall,” he elaborated. Farmers in Mustang even store groundwater for winter. However, that becomes challenging when there is too less rain during expected seasons. “We do try to store water for winter. But we are largely dependent on winter rain for the storage. So, we impatiently wait for winter rain and snowfall,” he explained. When the snow melts, it spreads evenly in the ground providing necessary ‘nutrition’ to the soil, he remarked. Mana Pun, another farmer from the Jhong Rural Municipality - 1 stated that the farmers are still hoping for more snowfall. Though it was far more than in the previous years, we are hoping for more snowfall, he said. Irrigation through other means is not possible in the high hills of Mustang, according to Pun. 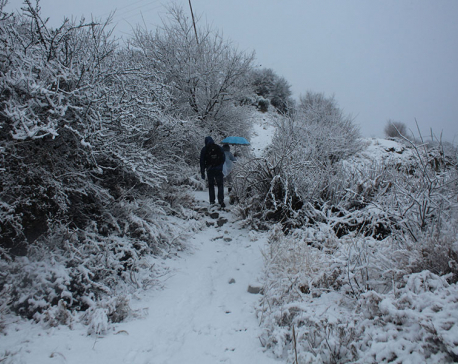 So, there is no other way than depending on snowfall for irrigating their crops. “We don’t know other professions or any other works. But farming is really challenging when you have limited means of irrigation. We all depend on snowfall here,” he said. Rains in monsoon do not quite please the farmers as sometimes it even brings natural disasters. Last time it swept away the irrigation canal leaving farmers in further problem. “Winter rain is soft. In rainy days, it does not go that well here around,” said Pun. After the canal was washed off, Jhong Rural Municipality invested for repairing it. In winter farmers cultivate potato, maize, and apples among others. 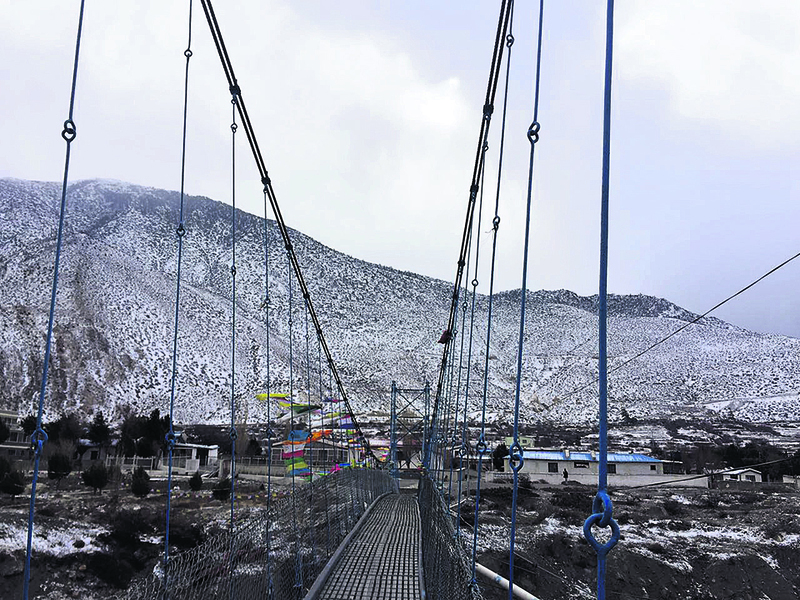 This time, Mustang has received a good amount of snowfall from Kagbeni to Lomanthang area. These areas are also popular among tourists. According to Bal Krishna Adhikari, a senior officer at the Shitoshna Bagwani Kendra, winter crops and vegetables are expected to give good returns this year. “There are chances of more snowfall. Let’s see,” he said. He added that the weather in Mustang and adjacent district is pleasant these days. This is a beautiful time to visit this place, he said.